HGC 225 is an AEC Regent II with Weymann H56R body, and it dates from 1946. It wears Country Area green in this view, and the fleet number STL2692. Allowing for the London method of bus overhauls, how many chassis and bodies have worn this fleet number over the years? It is on Itchen Bridge, while taking part in the Southampton city transport centenary rally on 6 May 1979. "How many chassis and bodies have worn this fleet number over the years?" The answer is, just this one. These post war STL Regents didn’t last long enough with LT to pass through the Aldenham works, which only became fully operational in 1956. 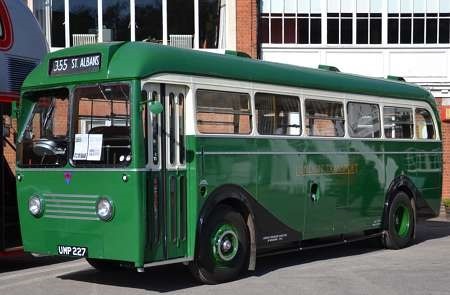 These buses were sold off by LT in 1955 as deliveries of the RT type became an embarrassment to the point where many new ones, together with others of the RTL class, were put straight into store upon receipt from the manufacturers. Some of these light STLs were used in 1954 on the 327 route at Hertford which traversed a weak bridge, but they were replaced in the following year by "pre war" (actually wartime) RTs which were less heavy than their post war cousins. This allowed the entire class of post war STLs to be sold to the dealer North of Leeds in July/August 1955. They soon found new owners with Dundee, Grimsby and Widnes corporations where they gave sterling service for upwards of six more years. STL 2692 went to Grimsby who got twelve years out of it before withdrawing it early in 1968. Roger, do you happen to know if one of the municipalities you mention, perhaps Grimsby, changed the gearboxes in their examples from crash to pre-select? I’m sure I’ve read it somewhere! Chris B – I hadn’t heard of this procedure, but if it did take place in Grimsby you have to wonder why go to such expense in a town which I assume is "as flat as a pancake" and driving a bus with a traditional transmission should surely present no problems. Chris and Chris – I can find no record of any of these former LT STLs undergoing a gearbox change from crash to preselector, but, if true, the most likely candidate amongst the subsequent owners must surely be Dundee which had a fleet of Daimlers and AEC Regent III at that time. Do we have a Dundee expert on OBP? The Grimsby situation should be easily determined by an examination of HGC 225 itself. One of my wife’s friends lives in Grimsby. I’ll check and find out in respect of the pancakes . . .
Wife’s friend has been consulted. Grimsby is largely flat with bumps, but Cleethorpes is generally hilly with flat bits. I think I travelled on all of Grimsby’s ex-STLs (nos. 42-47 of which HGC225 was 47. 43 was HGC222 and 46 HGC219 – don’t know the others). I am sure that none were changed to pre-selectors. However there were four (I think) ex-Sheffield Regents – nos. 41 and 48-50 (?) with registrations in the KWE250 series. These had more or less identical Weymann bodies, and were pre-selectors from new. They were visually identifiable by the deeper windscreen. I’m away from home at the moment, so this is all from memory plus one or two snippets I have filed on here! And then I realised…one of the Sheffield transfers featured in David Careless’s post in June 2013, and I responded at the time thus : "The transfers became Grimsby-Cleethorpes Transport numbers 41 (KWE 258), 48 (KWE 251), 49 (KWE 252) and 50 (KWE 254). The intervening numbers 42-47 were occupied by similarly Weymann-bodied Regent IIs ex London Transport (HGC 233, 222, 227, 228, 219 and 225 respectively)." As a one-tome Grimbarian, I remember STL2692 as Grimsby No. 47, bought in 1955 with five other STLs to replace trolleybuses on the 10 route. Dundee was the only buyer of this batch of STLs to convert them to preselector gearboxes. HGC 225 served her initial Grimsby years in a crimson lake and cream livery, after the 1957 combination of the Grimsby and Cleethorpes operations, her colours were various permutations of blue and cream. As conjectured earlier, it was for the Dundee tram-replacement fleet that some of these London Transport Regent II were converted to pre-selector transmission. A Buses Extra article detailed the changes. I believe all the gearboxes were reconditioned, previously fitted to pre-war Dundee buses in process of withdrawal. Thanks, Stephen A for the information, so it was Dundee who swapped the gearboxes for pre-selectors. I understand the post-war O661 Regent II was not offered with such a gearbox but the pre-war model (just Regent, not Regent I) was. I believe the gear selection was by means of a conventional type gear stick which rose from the floor rather than a steering column mounted unit although I’m not sure if this was universal. Stephen says the gearboxes were reconditioned units salvaged from pre-war buses. It would be interesting to know which method of selection was employed, whichever it was, it made Dundee’s conversions unique as Regent IIs. My recollection of all the London Transport pre-war pre-selective buses (I regard the first RT’s as being Wartime) I travelled on as having conventional floor-mounted gearlevers. I never came across a pre-war Daimler CO bus, but imagine that they would have had the simpler type of steering column lever which the CW types did in the war. "Why change something so simple?" might well have been Daimler’s attitude and it certainly continued with their CV’s. I had a neighbour when I lived at Morden, in Daimlerland, who’d worked both at both Putney and Merton Garages and felt that Daimler’s simple gearchange was preferable to the RT’s one. The later Daimler CVs (e.g. Derby Corporation’s fleet of CVG6s and no doubt many others) had an H-gate selector, similar to the AEC set-up, on the left side of the steering column (as opposed to the earlier quadrant type selector mounted on the right). The quadrant type of gear selector used on Daimler’s CO, CW and early CV series was the same as on Daimler cars. The CV changed to the AEC type around 1953-5. The preselector version of the Guy Arab had a floor mounted gear lever; Guy built its own preselector gearbox. I have submitted this vehicle under the London Transport heading as it is in ‘Country Area’ green and carries the London Transport fleetname. It is an AEC Regal IV with Park Royal B40F body, new as an AEC Demonstrator in 1949. Neither the Jenkinson list of 1978 nor the PSVC list of 2012 gives it a model number. It now forms part of the collection at Brooklands, where we see it (newly restored) on 13 April 2014. Looking through the driver’s windscreen this bus seems to have the later control binnacle beneath the steering wheel as produced for the Regent V/Reliance from around 1960. It also looks to have the Monocontrol semi-auto gearchange on the side of it. Was this original or has it been modified at some stage? When this vehicle was constructed in 1949 the maximum permissible length for a single decker was 27ft 6ins. This one and its left hand drive counterpart, together with the 25 private hire examples of the LT RF class were the only Regal IVs built to that length. After serving as a demonstrator with London Transport at St Albans, and then with others including SMT, UMP 227 went back to AEC as a works hack, where it managed to survive into preservation. The bodywork styling is clearly related to the immediate pre war LT Chiswick and Park Royal built buses of the Q, TF and CR classes. According to Alan Townsin’s book ‘Blue Triangle’, there were two Regal IV prototypes – as Roger has mentioned – both with Park Royal bodies. 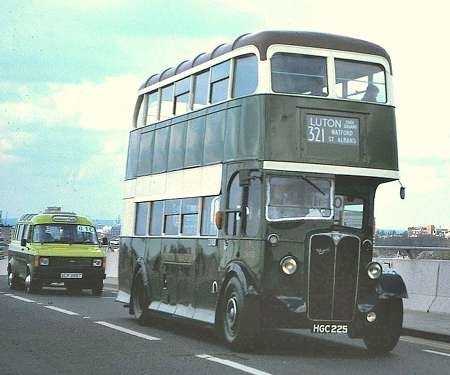 UMP 227 was finished in green livery as seen in Pete’s photo, and the other – a left hand drive version – wore a blue livery and went to Holland for a time before returning and being sold around the mid-1950s. (Sadly where it ended up is not stated). The author states that the prototypes "had chassis numbers in the U series of numbers used for experimental parts, a practice that became usual for subsequent prototypes or experimental vehicles, though the production type numbers were 9821E and 9831E for right and left hand versions". UMP 227’s chassis number is given as U135974, but that of the left hand drive prototype is not mentioned. Philip, the same source describes the Regal IV as having a "horizontal A219 version of the 9.6 litre engine and air-operated preselective gearbox, and air pressure brake operation". I would hazard a guess – a foolish thing to do on this well-informed website I know! – that the ‘Monocontrol’ semi-automatic gearchange binnacle you mention may well have been fitted during UMP’s subsequent life as an AEC Experimental Department hack. Philip, I’ve just had a look on the London Bus Museum website, which states that UMP227 was "originally fitted with air-operated pre-select gearbox, later fitted with mono control (sic) with overdrive on 3rd and 4th gears". Well spotted that man! UMP 227 does indeed have Monocontrol transmission. Regarding the second prototype fitted out as left hand drive I have a very vague recollection of seeing a photo somewhere, I know not where, of it being used as a roadside café somewhere in the south of England. I am probably totally wrong and having a senior moment if so I apologise in advance. 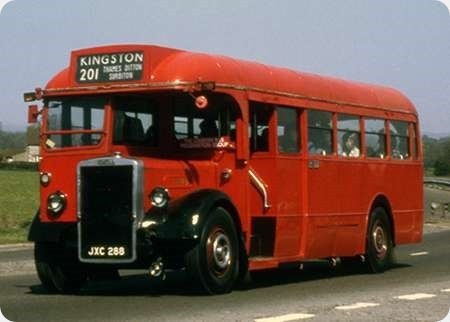 I see distinct similarities to the 1950 AEC Regal IV/Park Royal demonstrator VMK 271, which ended up on the Isle of Man as Douglas Corporation no. 31. In Gavin Booth’s book "British Buses In Colour" (Ian Allen 1996) there is a picture of Douglas Corporation No. 31, NMN 355 mentioned by Petras409. As he suggests, this was VMK 271, the other 27ft 6in Regal IV AEC demonstrator dating from 1950, originally built with left hand drive. It passed to the Isle of Man in 1951 and stayed there until 1974 when it was sold to Manx Metals for scrapping. A working life of 24 years is pretty good for a prototype, and testifies to the rugged reliability of the Regal IV, borne out by the long lives of the members of the LT RF class. The LHD prototype Regal IV did indeed finish up as a roadside café in the 1950’s, at Hindhead Surrey in a wooded car park just off the A3. My family regularly stopped there for refreshments at my insistence to look at a bus so different to anything else around. Suddenly one day it had gone, a sad day for a (then) youngster!